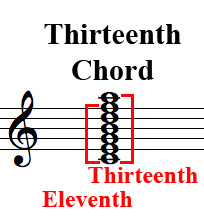 A chord having usually, but not necessarily, seven notes, the interval between the root note and the highest note being the interval of a thirteenth. The other notes in the chord would be the root, third, fifth, seventh, ninth, eleventh, and thirteenth. In the "C" chord below, the root is C, the third is E, the fifth is G, the seventh is B, the ninth is D, the eleventh is F, and the thirteenth is A. In many situations, the fifth, ninth and eleventh notes are omitted from a thirteenth chord.